Along the way, David and his company rejoiced with various instruments, and after arriving David danced while wearing a linen ephod. 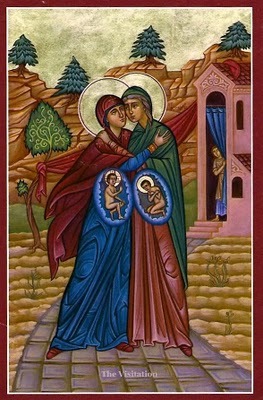 John the Forerunner lept in his mother’s womb at the salutation of Mary. The linen ephod that David wore was a priestly garment making him similar to John the Forerunner who was of priestly lineage. The Theotokos and the Ark stayed in a house in Judah for 3 months. While the Dormition of the Theotokos is not in Scripture, there is a parallel between the Ark and her dormition, as both Uzzah and the Jewish priest Athonios were chastised for touching the Ark with their hands. Uzzah was killed; Athonios’ hand was cut off then he repented and converted and was healed. And Mary arose in those days, and went into the hill country with haste, into a city of Judea; And entered into the house of Zacharias, and saluted Elisabeth. And it came to pass, that, when Elisabeth heard the salutation of Mary, the babe leaped in her womb; and Elisabeth was filled with the Holy Ghost: And she spake out with a loud voice, and said, Blessed art thou among women, and blessed is the fruit of thy womb. And whence is this to me, that the mother of my Lord should come to me? For, lo, as soon as the voice of thy salutation sounded in mine ears, the babe leaped in my womb for joy. And blessed is she that believed: for there shall be a performance of those things which were told her from the Lord.And Mary said, My soul doth magnify the Lord, And my spirit hath rejoiced in God my Saviour. For he hath regarded the low estate of his handmaiden: for, behold, from henceforth all generations shall call me blessed. For he that is mighty hath done to me great things; and holy is his name. And his mercy is on them that fear him from generation to generation. He hath shewed strength with his arm; he hath scattered the proud in the imagination of their hearts. He hath put down the mighty from their seats, and exalted them of low degree. He hath filled the hungry with good things; and the rich he hath sent empty away. He hath helped his servant Israel, in remembrance of his mercy; As he spake to our fathers, to Abraham, and to his seed for ever.And Mary abode with her about three months, and returned to her own house. And David arose, and went with all the people that were with him from Baale of Judah, to bring up from thence the ark of God, whose name is called by the name of the Lord of hosts that dwelleth between the cherubims. And they set the ark of God upon a new cart, and brought it out of the house of Abinadab that was in Gibeah: and Uzzah and Ahio, the sons of Abinadab, drave the new cart.4 And they brought it out of the house of Abinadab which was at Gibeah, accompanying the ark of God: and Ahio went before the ark.And David and all the house of Israel played before the Lord on all manner of instruments made of fir wood, even on harps, and on psalteries, and on timbrels, and on cornets, and on cymbals. And when they came to Nachon’s threshing floor, Uzzah put forth his hand to the ark of God, and took hold of it; for the oxen shook it. And the anger of the Lord was kindled against Uzzah; and God smote him there for his error; and there he died by the ark of God. And David was displeased, because the Lord had made a breach upon Uzzah: and he called the name of the place Perezuzzah to this day. And David was afraid of the Lord that day, and said, How shall the ark of the Lord come to me? So David would not remove the ark of the Lord unto him into the city of David: but David carried it aside into the house of Obededom the Gittite. And the ark of the Lord continued in the house of Obededom the Gittite three months: and the Lord blessed Obededom, and all his household. And it was told king David, saying, The Lord hath blessed the house of Obededom, and all that pertaineth unto him, because of the ark of God. So David went and brought up the ark of God from the house of Obededom into the city of David with gladness. And it was so, that when they that bare the ark of the Lord had gone six paces, he sacrificed oxen and fatlings. And David danced before the Lord with all his might; and David was girded with a linen ephod. * So David and all the house of Israel brought up the ark of the Lord with shouting, and with the sound of the trumpet And David went up, and all Israel, to Baalah, that is, to Kirjathjearim, which belonged to Judah, to bring up thence the ark of God the Lord, that dwelleth between the cherubims, whose name is called on it. And they carried the ark of God in a new cart out of the house of Abinadab: and Uzza and Ahio drave the cart. And David and all Israel played before God with all their might, and with singing, and with harps, and with psalteries, and with timbrels, and with cymbals, and with trumpets. And when they came unto the threshing floor of Chidon, Uzza put forth his hand to hold the ark; for the oxen stumbled. And the anger of the Lord was kindled against Uzza, and he smote him, because he put his hand to the ark: and there he died before God. And David was displeased, because the Lord had made a breach upon Uzza: wherefore that place is called Perezuzza to this day. And David was afraid of God that day, saying, How shall I bring the ark of God home to me? So David brought not the ark home to himself to the city of David, but carried it aside into the house of Obededom the Gittite. And the ark of God remained with the family of Obededom in his house three months. And the Lord blessed the house of Obededom, and all that he had. * The linen ephod is a priestly garment. John the Forerunner (the babe in Elizabeth’s womb) is of priestly lineage.